Look what's rolling up: learning fun! 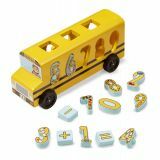 With a top that lifts off and number pieces and math symbols to fit through the matching holes--as well as cards featuring numbers and equations to match and eventually solve--this wooden school bus grows with a child's developing skills and interests. Durable construction means the fun will keep going through countless pickups and drop-offs!